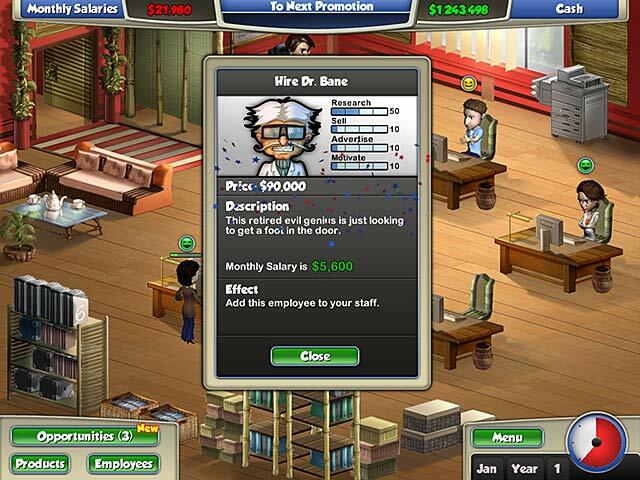 Take the reins of a lowly warehouse office and work your way up the corporate ladder in You're The Boss. Haunted by a mysterious voice in your head, you know nothing more than a prophecy that foretells your rise to success. But you can’t do it alone. 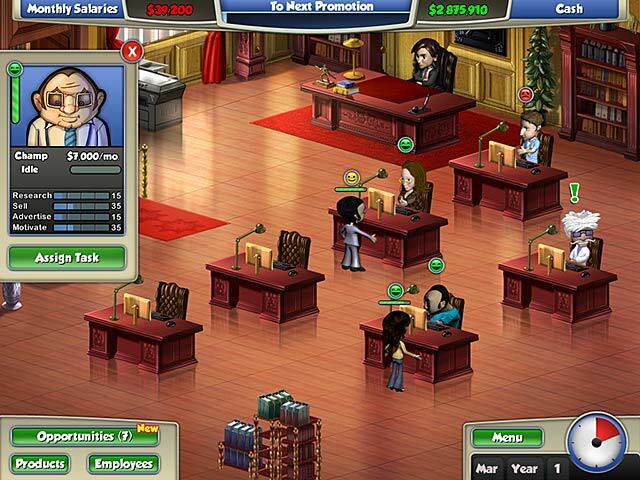 You first need to assemble a team of employees, each with unique skill sets and personalities. Sell and market your products, improve your employees' skills and morale, and research powerful opportunities to help you achieve your goals. Standing in your path are the six dreaded bosses, and only the most savvy of managers has what it takes to earn every promotion and fulfill the ultimate prophecy. You're The Boss is rated 3.0 out of 5 by 81. Rated 5 out of 5 by africanrose32 from I really love it! Its very challenging i just dont know how to keep the morale up. Rated 5 out of 5 by merlinarcane from You Really Are the Boss! Great game with cute storyline! Some of the things that you get to do are hire people and hone their skills, get them to sell products and motivate each other. As far as the business end of things goes, researching products to sell and increase your profits goes along with your goal - you're running your own business and want to be successful and get rid of your current boss. Complicated? Not at all! It's a bit of a different TM game and a welcome change for me. A great part of the game is that you don't need to click like crazy to get things done. Even though there is a timer on the level, it's not a high stress game and is enjoyable enough to be played over and over. I heartily recommend the game! Rated 5 out of 5 by sdszmore from Dont Underestimate This game is very fun! I almost didn't download it because of the three star rating. I did, and I don't regret it at all! Very entertaining game, it gets very challenging. Rated 5 out of 5 by reba87 from It's a good game I like the game, and have found it a little easy, my biggest nitpick of the game is if you quit, you have to start the whole level all over again. Rated 5 out of 5 by reilly11 from very good I played the trail of this game and I can say I loved it! its very different from other games, and it has a bit of difficulty to it, I highly recommend this game. Rated 5 out of 5 by kates2424 from I love any TM game that has a different story and objectives I just got this game on Thursday or Friday and I have played it through 3 times. I really like it. It's different from the same old gather rocks/gold/food TM game. Pros: Different story than other TM games Different objectives "" '" "" Easy to dive in without too much figuring out too many different actions yet challenging enough that the first time I played through that final level was pretty hard. Cons: Too short - I could have used some more levels Not enough variety when you replay the game again and again. I gave this 5 stars primarily because I am so happy when a new TM game comes out that is not rock/food/gold collecting. Rated 5 out of 5 by SimbaKomba from I enjoyed it! This is a fun game! There is no real 'against the clock' pressure, you can pretty much work at your own pace. The game isn't going to win any awards, but I've enjoyed it for a distraction after work and study. Don't dismiss this game straight away, give it a trial and see for yourself! Rated 5 out of 5 by MidnightClover from Very interesting Great game. I love how you actually stratagize your office with your employees and money. Rated 5 out of 5 by chaleur from Fun and Different This game is pretty interesting, and it's not quite as derivative as a lot of games coming out these days. It does take a lot from Miss Management, but that was an awesome game, so this isn't a bad thing, and it's not Yet Another My Kingdom For The Princess Clone, thank goodness. It's true like the other reviews say that there's a waiting mechanism, but it's no different than the waiting you do in most Time Management games. If everything happened at once, the game would be unplayable. The consequences of your action are delayed to allow you to go off and do something else while your customers eat, or your food cooks, or the like. That's how time management games work. I will agree with the posters who said that the game could have used a bit more debugging. I found at least one instance so far where the tutorial broke when I had queued an activity before they expected me to do it, but it wasn't fatal. I just had to exit to the main menu and return, and it was fine. Totally manageable, and a great game. I recommend it. Rated 5 out of 5 by FloridaGirl7264 from Cute game I played the full trial and had a great time. It's along the lines of a sims style game. It's cute! Try it and see what you think. 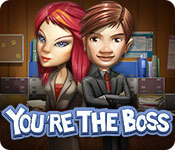 Take the reins of a lowly warehouse office and work your way up the corporate ladder to fulfill a mysterious prophecy in You're The Boss.